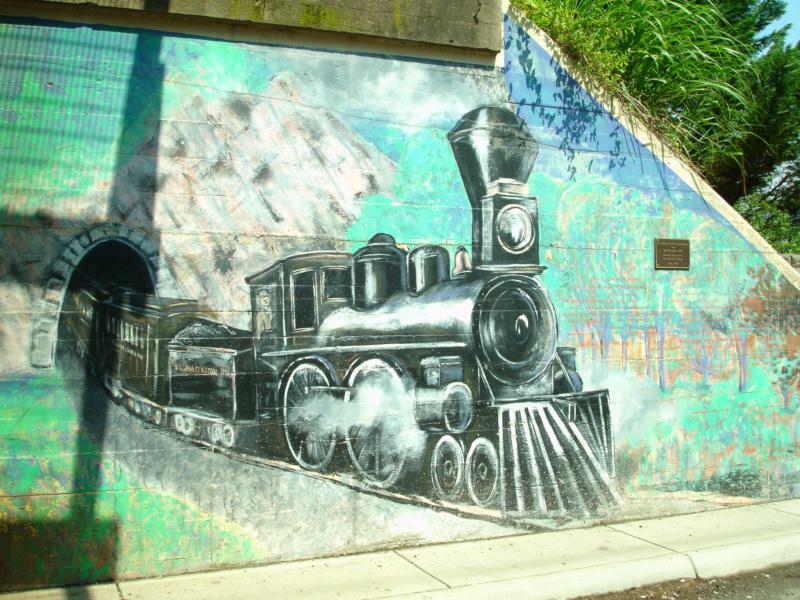 The community of Crozet began as a whistle stop on the Chesapeake and Ohio (C & O) Railroad that was established at the request of the Miller Manual Labor School (the Miller School), which had been founded a year earlier. Originally called “Wayland’s Crossing,” it was renamed in 1870 in honor of Colonel Claudius Crozet (1789-1864), the French-born civil engineer artillery officer under Napoleon who is best remembered as the chief engineer for the 17-mile long railroad tunnel through the Blue Ridge Mountains. It’s situated along the I-64 corridor, approximately 12 miles west of Charlottesville and 21 miles east of Staunton. Its population in 2010 was 5,565 although that number has grown to more than 7,000 due to all the new construction activity in the past few years. Each year, Crozet holds an Independence Day celebration, which consists of a parade through the downtown area, a carnival in Crozet Park lasting for several days, and sizeable fireworks show to bring the festivities to a close. Historically, Crozet was strategically important as a depot and transportation hub for the local apple and peach growing industries. Morton Frozen Foods had its flagship manufacturing plant located here from August 1, 1953, until the late 1990s. In 2000, food packaging company, ConAgra Foods, who last owned the brand, closed the plant, laying off more than 600 employees. Today Musictoday, acquired in 2014 by San Francisco-based Delivery Agent Inc., an interactive entertainment-commerce firm, operates out of the building. In the same spot, Crozet has also been home to the Starr Hill Brewery since 2005, having relocated from nearby Charlottesville. The Downtown area of Crozet has seen rejuvenation with the new library, as well as the recently opened rooftop terraced building – Piedmont Place – that is home to several small businesses, including an amazing new ice cream shop, Crozet Creamery, and two restaurants, one offering great BBQ – Smoked Kitchen & Tap – and the other – The Rooftop – that’s drawing crowds for its amazing Blue Ridge views. No mention of Crozet is complete without noting, in hushed and reverent tones, Crozet Pizza, now celebrating its 40th year. According to their website, it was opened in 1977 by owners Bob and Karen Crum, along with their four children. When Crozet Pizza opened, it had five tables, all hand built by Bob himself. Before opening, Karen perfected the dough recipe that is still made daily at both locations. Bob created the distinctive pizza sauce that continues to delight customers today. He hand made every pizza that was served for 31 years, one by one. As its popularity grew, people began to call in days ahead to order one of Crozet Pizza’s delicious pies. In 2004, Bob and Karen retired and sold the business to their daughter, Colleen, her husband Mike Alexander and their three daughters. Today, Crozet Pizza continues to be a family owned business. New selections of salads and pies have been added to the menu, and pizzas continue to be made with fresh ingredients, local products (whenever possible), and of course Karen’s dough recipe and Bob’s special pizza sauce. In addition to the original restaurant, Crozet Pizza is now open in Charlottesville in the historic Corner District on Elliewood Avenue. Over the past 15 years, Crozet has seen an increasing rate of housing development, in part because of nearby Charlottesville’s reputation as a desirable location, but also because Albemarle County named Crozet as a designated growth area. While parts of the County are growing significantly, 95% of the County remains designated as rural. In 2001, the Albemarle County Board of Supervisors approved a framework dubbed the “Crozet Master Plan” developed by a local architect and regional planning firm, in order to regulate development patterns and provide a public forum for discussing the topic. The Master Plan allows the population of Crozet to grow to over 12,000 people by the 2020s—more than four times the 2001 population. By 2013, the population had swelled to over 7,000. These numbers have alarmed some long-time residents who are accustomed to the rural tranquility of Crozet, and over a thousand people have petitioned the county to cut down on the number of planned households. Another change coming to Crozet involves the redevelopment of the old Barnes Lumber property, which encompasses much of the downtown section, into a pedestrian mall. The Crozet Historic District was listed the National Register of Historic Places in 2012. Crozet is served by Western Albemarle High School (WAHS), J. T. Henley Middle School (Henley), Brownsville Elementary School, Meriwether Lewis Elementary School, Murray Elementary School and Crozet Elementary School. All schools are part of the Albemarle County Public Schools and are situated along Highway 250 and nearby to Interstate 64. WAHS is a public high school serving the central area of Albemarle County. It was opened in September 1977, and is situated at the foot of the Blue Ridge Mountains on a 75-acre site across from Old Trail and has an approximate enrollment of 1,100 students. The school’s athletic mascot is the Warrior. On the Old Trail side of Rt. 250 West is Henley, located on approximately 30 acres of land, that feeds into WAHS. It was first opened in 1966. The school was built using the same blueprints as Jack Jouett Middle School. However, after a renovation/addition in 1999, the two schools differ slightly in design. Henley has a capacity of 690 students. The school’s athletics mascot is the Hornets. Directly opposite from Henley, on the same side of Route 250, is Brownsville, which shares an entrance from the highway with the middle school. Brownsville students graduate from the school to attend Henley. Crozet (the newer building) is located in rural Crozet on Crozet Avenue, across the street from the original Crozet Elementary building. Named after Claudius Crozet, the school feeds into J. T. Henley Middle School. Crozet teaches kindergarten-5th grade. It has about 402 students. Other schools that feed into Henley are Meriwether Lewis and Murray, both of which are located in the vicinity of Ivy. Because of Crozet’s location in the foothills of the Blue Ridge Mountains, its natural scenery is one of its distinguishing features. Outdoor activity is popular among residents and visitors. Claudius Crozet Park is a 22-acre non-profit recreational facility where various sports organizations local to Albemarle County come to play and practice throughout the year. It has fields for baseball, T-ball and soccer, as well as a year-round swimming pool, recreation center, three 36-foot QuickStart Tennis courts and several playgrounds. The Crozet Gators Swim Team attracts roughly 300 members and became the Jefferson Swim League champions for the first time in 2013. The Park is also host two times a year to the Crozet Arts Festival – in May and October. Mint Springs Valley Park contains three lakes and 502 acres of land, and boasts an extensive network of hiking trails which offer beautiful views of the surrounding area. Between Memorial Day and Labor Day, the park’s artificial beach is opened to the public and staffed with lifeguards.